Mysore, officially renamed as Mysuru, is the third largest and populous city in the state of Karnataka. The city is located at the foothills of the Chamundi Hills and is about 146 km southwest of Bengaluru. The city was the erstwhile capital city of the Kingdom of Mysore for nearly 600 years which was ruled by the Wodeyar dynasty; for a very brief period the kingdom was suspended when Hyder Ali and Tipu Sultan were in power. The city is known as the Cultural Capital of Karnataka due to its cultural ambiance and achievements. Mysuru is well known for its heritage structures and palaces which include the Mysore Palace, Chamundi Hills and many more. The city is well known for its Dasara festivities, for which people gather here weeks in advance. 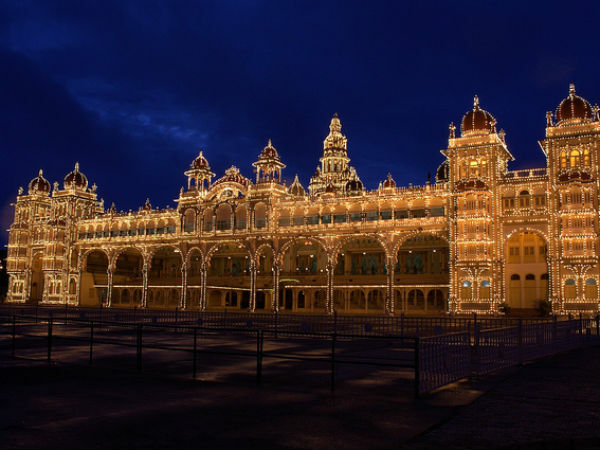 The city also gives its name to some well known art forms and also to cultural festivals like the Mysuru Dasara, Mysore Painting along with dishes like the Mysuru Pak, brands like the Mysore Sandal Soap, Mysuru Silk sarees and many more. By Air: Although Mysuru has its own airport, it does not have any commercial operations. Hence the nearest airport is the Kempegowda International Airport in Bengaluru which is approximately around 185 km away from here. By Train: Mysuru Junction is the major railway station here, which is located at the heart of the city and has regular trains to all major towns and cities across the state and to a few places around the country. By Road: One of the best ways to reach Mysuru is by road. The town is well-connected by roads and there are regular buses which operate from major cities to Mysuru. For those who are opting to travel by Route 1, it would take you approximately around 3.5 h to reach Mysuru, via NH 75. The route takes you through the well-known towns of Ramanagara, Mandya, Srirangapatna, etc. The roads are well-maintained, which helps one to cover the distance at a good pace and the destination is about 150 km through this route. If you opt for Route 2, it would take you approximately 4 h to cover a total distance of 160 km from Bengaluru to Mysuru, via NH 209. On Route 3, it would take you around 4.5 h to cover the distance of 188 km, via NH 75 and NH 150 A, to reach Mysuru. The journey can be planned as a weekend drive. So, one can opt to leave on a Saturday morning and after spending about a day and half, one can start travelling to Bengaluru either on a Sunday morning or afternoon and reach Bengaluru city by evening or night. An early morning start from Bengaluru is a must for two reasons, one to beat the city traffic and second to beat the highway traffic. Once on the highway, there are plenty of options for one to have a filling breakfast, which begins from the thatte idlis of Bidadi to the yummy dosas at Kamat Loka Ruchi in Ramanagara. After a filling breakfast, one can head straight to the historical town of Srirangapatna. Srirangapatna was the capital of Tipu Sultan, and is well known for the temples dedicated to Sri Ranganatha Swamy and Nimishamba Devi apart from Tipu Sultan's armory, Gumbaz, Daria Daulat Bagh and the Triveni Sangam. The Sri Ranganatha Swamy temple here is one amongst the five sacred sites dedicated to Lord Vishnu together known as Pancharanga kshetrams and the deity here is known as Adi Ranga. The town derives its name from the deity. The Daria Daulat Bagh is the summer palace of Tipu Sultan which was built in the year 1784 in the Indo-Sarcenic style and is made of teak wood. The Gumbaz is a mausoleum which houses the mortal remains of Tipu Sultan, his father Hyder Ali and also his mother Fatima Begum. Apart from the three, there are also other tombs of various other relatives buried here. The Nimishamba Temple is located on the banks of the Lokapavani river. Devotees believe that the goddess answers their prayers within a minute. After visiting some of these places one can proceed further to the destination of Mysuru which is around 20 km from here and would take about half an hour to reach the heritage city. Mysuru is the abode of Goddess Chamundeshwari; hence, head straight up to the Chamundi Hill and have a darshan of the beautiful goddess and the Nandi. One can get a birds eye view of the entire city from here; one cannot miss the statue of the Mahishasura. The hill has two temples, one dedicated to Mahabaleshwara and the other to the Goddess Chamundeshwari. The next major attraction here is the majestic Mysuru Palace, which is still the official residence of the members of the Wodeyar dynasty. The palace was built during 1897-1912 in the Indo-Saracenic style under the guidance of the British architect Henry Irwin. The well designed square towers, the domes along with the ornate ceiling and the sculpted pillars of the Durbar Hall are major draws here. The other places to visit are the Sri Chamarajendra Zoological Gardens, St Philomena's Church, Karanji Lake, Brindavan Gardens, KRS Dam and the Jaganmohan Palace.